The Oregon Department of Education (ODE) added information in the opt out form packet that states that if a student doesn’t take the Smarter Balanced Exam (SBAC), then valuable learning information will be lost. What is this valuable information? How would this information be used to guide instruction? Last year, I was called into a full-day meeting to go over the first year’s SBAC results with the intent of looking at what areas of instruction we needed to focus on. At the end of the day and after contact with ODE experts, we were unable to get one piece of information about which areas we would need to put extra time in for instruction. We were told that we would have to give additional formative assessments to get that information. So what were we told is the purpose of the test? Accountability. When the projected cut scores were first released they showed that English Language Learners (ELL) students, had a projected rate pass rate of 5% or less in some of the grades, I filed a complaint with the Office of Civil Rights. My complaint was rejected because they said that since most everyone would be failing, then I couldn’t prove discrimination against any protected class, such as ELL or Special Education students. You don’t need to be an expert in data or statistics to come to the conclusion that this test is not valid. It does not give teachers the information they need to determine how to better make students college and career ready. The results don’t come out in time to make instructional decisions. The test discriminates against ELL students as the pass rate threshold is so low that no valid data conclusions can be made. The test is an autopsy of our failure to provide adequate services for ELL students. This is different than what Stand for Children and Chalkboard Project infer that it is because of poor teaching that the students are not succeeding. We continue to document the opportunity gap, and it should come as no surprise that it is not improving. Now that the official scores have been recently released by the ODE, we are seeing some articles trying to draw some conclusions about the merit of the test and the performance of the students. Data can be interpreted in a variety of ways, some of which will support a predetermined assumption or result. You can look at overall passing rates, growth formulas, and comparing school and district performance with statewide performance. A congratulatory email from the superintendent in my district went out to all staff outlining our district’s performance against the state’s. While we are a high-performing district with hard-working dedicated staff, many students are being left behind. And if we are near the top, what about the rest of the students in other districts? This breaks my heart, as students only get one chance to be in school. ODE says that the SBAC measures the achievement gap with about the same accuracy as the previous assessment. What is the purpose of this measurement? Rachel Rich, a member of Eugene Community Alliance for Public Education (CAPE) has written this letter to Oregon Legislators and Education Leaders regarding the Smarter Balanced Assessment. Please write your own letter to your legislators as well as to the Oregon House and Senate Education Committees. 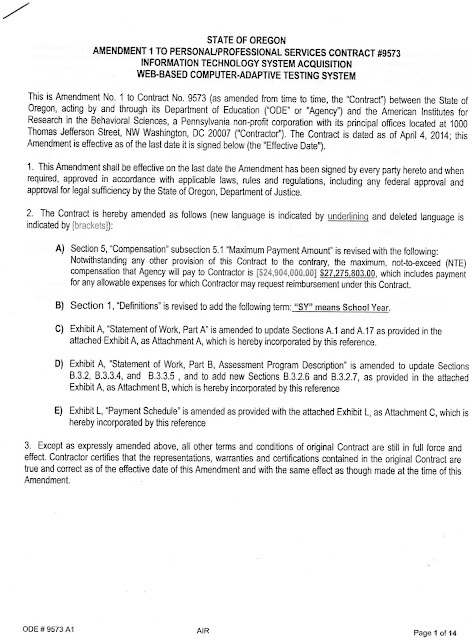 The Oregon Secretary of State just published an audit of standardized testing costs pursuant to HB 2713. For an accurate accounting of costs relative to achievement, they should have dug deeper into their own data. To wit: according to their own contract, they paid over $27 million to AIR to administer OAKS and Smarter Balanced. Further, the ODE website lists each district's expenses line by line, including items related to state mandated testing. No need to guess. The results are clear: testing costs have risen significantly. But in light of today's cost-cutting measures, a test that doesn't provide prompt and specific guidance to individual students and their teachers is a poor expenditure. Smarter Balanced reports do not offer specific information like whether students understand fractions or grammar, and reports aren’t returned for one full year. We don't need to tinker with this test, we need to replace it. While we continue to waste money on this poor quality testing program, there are fewer engaging electives to keep kids in school, while counselors, field-trips, talented and gifted programs, or speech and audiology services are scarce. Ironically, despite spending massive amounts to identify under-performers, only a fraction was spent on remediation, pre-K, early intervention, and Title I in 2014-15, far less than in 2010-11! This is not progress. By 2010, in just nine short months, Common Core and Smarter Balanced were completed, but still not fully implemented while OAKS was still in use in Oregon. Although the state pays generously for OAKS and SBAC tests in the form of annual membership dues, per-pupil fees, data storage, help desk, scoring and reporting, nevertheless, individual school districts were responsible for the rest. District budget items likely affected are labeled not just "testing", but ranged from staff development and substitutes to technology and data management. District staff require extensive training to administer online standardized tests, which dominates both staff meetings (which are not a line item) and paid presentations. Previously, professional development was devoted to best practices in teaching, instead of testing. The current trend brings both financial and pedagogical costs. Online testing increases computer purchases, as well as updates to existing operating systems. Both Microsoft and SBAC phased out service to Windows XP, which constituted the majority of school computer operating systems. Besides multiple OS upgrades, testing required increased bandwidth. Because I taught in Springfield for several decades and that is where my grandchildren attend school, I chose District 19 as a test case. Comparing 2010 and 2014, here are Springfield's budget items likely affected by standardized testing. Some items went up, while others were reclassified. Overall, even counting for inflation, costs rose significantly. Note: In spite of Oregon's woes, Springfield has expanded programs for English Language Learners and continued to provide support services at Brattain House. Further, this year the district has appointed a full-time coordinator, former school board member Jonathan Light, to design career strands leading students on a more direct path to success. The goal is to offer each student career counseling, while rebuilding electives that inspire future vocations and avocations. But think how much easier that would be if fewer millions were directed to over-testing. This post by is by Oregon SOS member Doug Garnett, written on Sept. 15 and sent out in our monthly newsletter. Last year the Oregon legislature passed a bill, introduced by Representative Lew Frederick, requiring a state audit of the SBAC testing process. The bill instructed auditors to look at all costs (not merely state line item costs), impact on instructional time, and much more. This week the Oregon’s Secretary of State’s office released the audit. And it's a conundrum. Here’s a few bits of that conundrum. First, it finds very serious problems. Just buying the SBAC tests is far more expensive than OAKS was. There’s major confusion about why these tests are given and whether the results have meaning. There’s critical concern that the tests punish certain populations (a typical problem of this type of testing) and that results are used inconsistently. And serious concerns that SBAC isn’t comprehensive - it focuses on only a narrow range of education. Then, the audit regurgitates SBAC marketing material without challenge. I thought auditors were supposed to be critical thinkers. Instead, for example, they accept at face value the claim that these tests evaluate critical thinking. Experts in testing don’t think it does. Truth is that the only thing known about SBAC is that it CLAIMS to evaluate critical thinking. Third, the audit ignores critical issues. For example, I’ve estimated these tests drain educational time worth over $200 million annually from local schools and districts. Yet the audit only considers line item state costs of around $10M. Penny wise and pound foolish? The audit also doesn’t challenge the idea that individual scores have accuracy. Established fact is that tests like these have incredible error when looking at individuals or small groups. That error is only controlled once 300 or so tests from similar students are grouped together. Yet the auditors seem to accept at face value the claim that SBAC evaluates individuals. Finally, unbelievably, the audit makes recommendations that ignore what it found. The audit merely recommends, gosh golly, that ODE communicate better and administer the tests more aggressively. SBAC failure is NOT a problem of communication but of poorly designed testing theory and educational theory. Communication can’t solve that problem. Even worse, “communicate better” is what Bill Gates has said as it has become clear his Common Core State Standards vision is a failure. So I gotta ask, who’s in charge of Oregon’s education policy? Sending the audit through my “decoder of bureaucratic language” I conclude that this is nothing more than a whitewash of Oregon Department of Education’s flawed SBAC theory. All I want to know is how the ODE Tom Sawyer got the Secretary of State’s office working on that fence. Oregon Save Our Schools urges you to contact members of the Oregon House and Senate Education committees, as well as your own state representatives regarding this flawed audit. 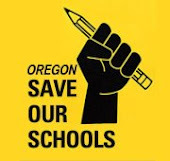 Oregon Save Our Schools has sent the following letter to Oregon's superintendents and local school board chairs. As you will read, the letter has also been sent to our state level leaders. If you would like to support this letter, please let your local leaders know you support it by contacting them. You may want to link this blog post. You should also contact the House and Senate Education committees, the Oregon State Board of Education and Oregon's Chief Education Officer. You can also contact your own legislators. As ESSA is rolling out in our state, we urge you to take a stand against the past practices begun with NCLB that created a test and punish accountability system. This system was in place for 15 years and did nothing to improve our schools. We have read Salam Noor’s letter to Secretary John King commenting on the proposed ESSA regulations. While we appreciate Dr. Noor’s requests to drop the requirement King proposes for a single summative rating in favor of a dashboard approach to measures of school success as well as his request to allow states to determine, with community input, what measures should appear on state report cards, we wish that his to allow states the time to develop and incorporate “innovative measures of accountability” were a little more direct. What we believe that Dr. Noor is trying to get at with the “innovative measures” comment is the fact that Smarter Balanced has been an utter and abject failure, as has every other standardized measure of achievement, at truly measuring how well schools serve our students and communities. Smarter Balanced in fact represented a doubling down on reliance on a very limited measure of student success and achievement, as well as school quality, with a singular focus on test scores in two subject areas. We wish that Dr. Noor had been more direct in condemning not only Smarter Balanced, but the entire failed system of using test scores to drive school improvement and had stated that Oregonians intend to work together to create a new path that uses assessment FOR learning and demands a system of accountability related to inputs in at least equal measure to outcomes. We would like to share with you the statement that the Vermont State Board of Education sent to Secretary King because we believe that this is what true education leaders should be shouting to the rooftops: the test and punish system has failed. Tweaking it won’t fix it. It is time to support and fund a well rounded education for ALL students. The gap that must be closed is an opportunity gap, not an achievement gap. Further, requiring all children to meet some sort of time table to achieve a certain number of points on a scale, particularly when there is no attempt to equalize support to those children let alone provide extra support to children who need more, is nothing less than a Sisyphean task that dooms our schools and many individual children to a perpetual label of “failing”. This is why Oregon citizens worked together to pass an Opt Out bill: we refuse to condemn our children to this dysfunctional cycle. We are quite stunned that this was not mentioned in Dr. Noor’s letter. We hope that the will of the people of our state will be supported by our state officials, regardless of any decisions that ultimately come out of Washington, DC. It is time to demand clearly and resoundingly a system that puts student assessment and education plans in the hands of professional educators and families and moves away from one-size-fits-all arbitrary timelines and cut scores. It is time to end what the Vermont Board referred to as the “commoditization” of our schools. It is also time to demand that all students are provided with adequate and equitable resources and that local communities are allowed to select and teach curriculum that is culturally responsive to the needs of each community. This is the only way that each child can become his or her best self. It is our job as adults who care for them to demand that. The Educator Effectiveness Workgroup has been charged with the task of identifying possible supports for districts to better ensure that every Oregon student is taught by a high quality, effective teacher and every Oregon school building is led by a high quality, effective educational leader. This includes discussions regarding the implications of Senate Bill 290, considerations for improving how state and local districts might better determine the effectiveness of educators, as well as how best to infuse elements of the Equitable Access to Excellent Educators Plan into Oregon’s State Plan under the Every Student Succeeds Act (ESSA). *Benefits of the Evaluation Matrix, drawbacks of the Matrix, if not the Matrix, then what? *Complete a more comprehensive analysis of SB 290, specifically focusing on evidence of the measures for Professional Practice, Professional Responsibilities, and Student Learning and Growth. *Discuss long-term modifications to OARs Further review and recommendations regarding the use of the Equitable Access to Excellent Educators plan within the ESSA plan. At our June 28th meeting, the Educator Effectiveness Workgroup will review the definition of “licensed educator” in Oregon and finalize considerations surrounding the Equitable Access to Education plan and Senate Bill 290.